CNN – (KUTV) Donald Trump’s most recent comments about Hillary Clinton have sparked chatter on social media and prompted CNN to hosts guests on the topic. While the guests, including conservative commentator and columnist Kurt Schlichter, were slated to talk about Trump’s comments about Clinton’s 2008 loss to Barack Obama, the conversation focused more on the Democratic candidate’s husband and his affair with Monica Lewinsky. “It’s going to take a lot more for me to get upset [about] a woman who enabled a guy who turned the Oval Office into a frat house,” Schlichter said , comparing former president Bill Clinton to GOP hopeful Trump. When Schlichter said Hillary Clinton was “given the choice to stand with a serial sexual abuser,” Lemon responded by telling his guest to stop and tried to steer the conversation back to Trump. 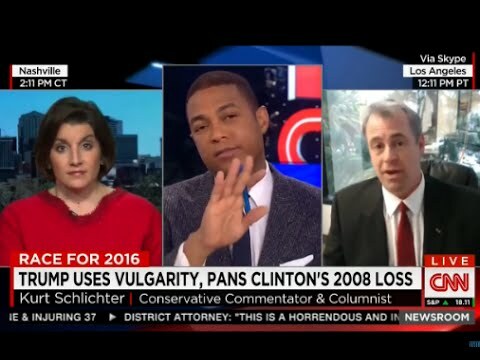 Lemon asked whether Schlichter had ever heard a presidential candidate say things inline with Trump’s comments about Clinton getting “schlonged” by Obama in the ’08 race. “I know of a president who, well, turned his intern into a humidor, so I think we set the standard a little lower than Donald Trump even approached,” Schlichter said. Schlichter and Lemon continued to argue, with the host finally cutting off the interview. Previous The Only Thing That Stops A Crazy Man With A Hatchet Is A Good Guy With A Gun?